A dislocated shoulder is a common injury, particularly among young athletes and the elderly. In fact, people tend to dislocate their shoulders more often than any other joint in the body. If you’ve dislocated your shoulder and you’re in the Reno, Nevada, area, the professionals at Tahoe Fracture & Orthopedic Medical Clinic can help diagnose and repair your injury. A dislocated shoulder occurs when the humerus (the upper arm bone) comes entirely out of the shoulder socket (as opposed to a subluxated shoulder, which occurs when the humerus comes only partway out of the socket). This generally results from impact or undue force on the shoulder joint, although it can also occur when the arm is sharply twisted. 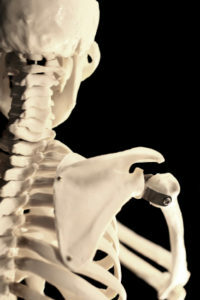 Because the shoulder joint is so mobile, a shoulder can dislocate in almost any direction. The pain associated with a dislocated shoulder is intense (often so intense that it causes sweating, nausea/vomiting, lightheadedness, or fainting) and it tends to increase when the affected arm is moved. In many cases, the professionals at our Reno, NV, facility can treat a dislocated shoulder using a closed reduction, in which they gently ease the humerus back into the shoulder socket. Patients often report experiencing immediate pain relief after undergoing a closed reduction. In more severe cases (such as where the surrounding tendons or ligaments are torn, where the nearby blood vessels or nerves are damaged, or where the patient has already suffered multiple dislocations), we may need to perform surgery to realign the bones or tighten the surrounding tissue. Because the pain and swelling associated with this condition will only increase as time passes, if you have suffered a dislocated shoulder in the Reno, NV, area, please contact Tahoe Fracture & Orthopedic Medical Clinic’s office as soon as possible to arrange for treatment. We look forward to helping you repair your injury and regain shoulder function.